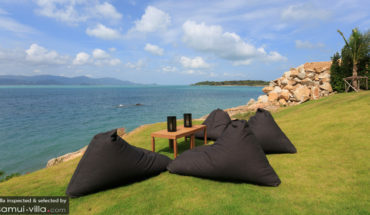 A vacation at scenic Samui involves plenty of sun, sand and sea. On top of these, you’ll also get to enjoy plenty of palatable Thai fare – think meals involving plenty of spicy curries, seafood whipped up in sweet-and-sour sauces and salads that pack a mean, tangy punch. For a fine meal in a decorative setting, make your way to Spirit House at Chaweng. 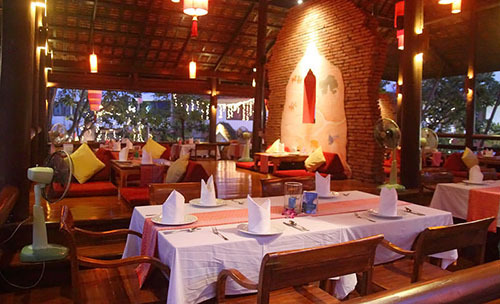 The restaurant’s traditional Thai architecture, tasteful teak wood furnishings and romantic lighting create an intimate atmosphere perfect for a special dinner. A variety of classic and fusion Thai dishes fill up the menu, while a limited selection of Western fare caters to diners unused to local flavours. 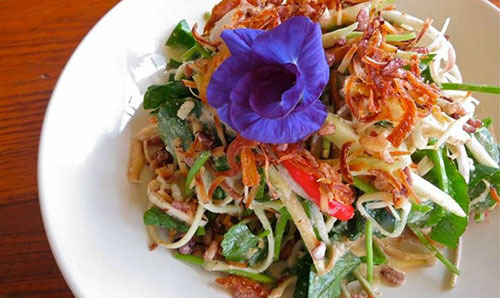 Those who enjoy eating as the locals do can opt for well-loved favourites like the papaya salad and massaman curry. Thoughtful touches, such as the beautiful tableware and prompt service round out an excellent dining experience. Phensiri Thai Bistro’s trendy setting, unpretentious vibes and contemporary interiors draws a large crowd. In the eatery’s fuss-free and casual environment, you will feel at ease tucking heartily into your favourite phad thai, tom yum or beef curry dishes. Healthy and wholesome best describes the food at the popular Sweet Sisters Cafe. An extensive selection of vegetarian and vegan fare makes this a great spot for veggie-lovin’ travellers, and the array of Thai and fusion dishes on the versatile menu draws an eclectic crowd. Only the finest and freshest produce are used here to create generous portions of mouthwatering local favourites like the laab moo, miang kam and Thai curries. For discerning foodies on the search for a local haunt, The Hut Cafe is a gem of a find. The bustling crowds dining at the eatery is a sure testament to its tasty Thai fare. Reservations are advised, as additional customers will be turned away during the busy dining hours. Down ice-cold beers and refreshing coconut milkshakes to cool down from the heat before you start savouring a spread of appetising dishes flavoured with tangy Thai spices. You know a restaurant’s worth checking out when it clinches the top spot on Travel + Leisure’s list of Best Beach Restaurants in the World. 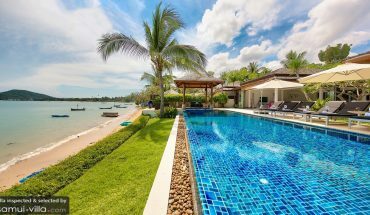 Maybe it is due to the fact that everything tastes better at the beach – the salty sea breezes add a flavourful edge to the seafood dishes, and the scenic coastal surroundings encourages one to linger on for additional nibbles. Feasting on the fresh catches of the day is an obvious choice here, so go ahead and fill up your table with irrestible-sounding items like the fish in tamarind chili sauce, crispy calamari and seafood with green mango salad. You are likely to savour the best local dishes when you dine at places that the locals do. This is the case when you enjoy at meal at Khao Hom Restaurant, a place known for its traditional Thai and seafood fare. The lengthy menu makes deciding on what to have for dinner a tricky affair, but when in doubt, it is best to stick to crowd pleasers like the moo kua kapi (stir-fried pork in shrimp paste), gaeng som with shrimp, and pak liang (stir-fried vegetables with eggs. Adventurous diners hankering for a taste of the exotic may give the wild boar with papaya or hot-and-sour frog dish a go. We also recommend flipping to the back of the menu to explore a range of Samui-inspired dishes, like the spicy seaweed or crab and shrimp with coconut cream. Yum. 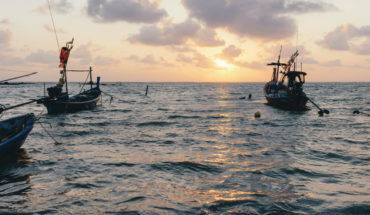 Samui has a cuisine of its own, and local chefs well-versed in the art of dishing out Samui-inspired dishes will whip up a storm of delights with a strong emphasis on two particular ingredients: seafood and coconuts. 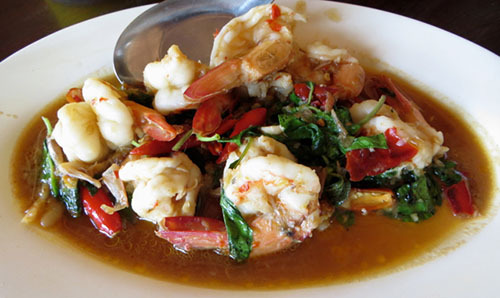 You will find sumptuous examples of such dishes at Takho Bangpo. A meal at this restaurant is a leisurely and relaxed affair, and its beachside setting adds on an alluring charm. Kickstart your meal with a complimentary appetiser of shrimp paste mixed with grated coconut, garlic and chilies, before moving on to the excellent green mango salad, bpuu phat kari and tom waay. The best dishes to savour vary according to the seasonal catches, so be sure to ask the wait staff for their recommendations. 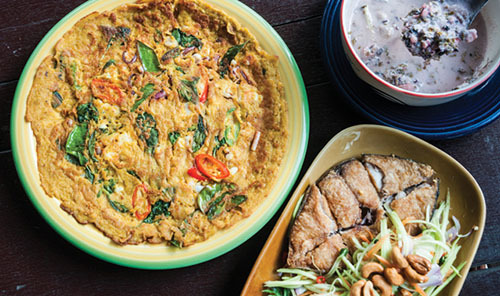 A meal at Sa Bieng Lae often leaves diners with a satisfied palate and nods of approval. The restaurant’s seaside setting promises ocean views for a tantalising Thai dinner made up of dishes like gaeng kua hed lhoob (mushroom curry), wai kua (squid simmered in coconut milk), and gang som pla grabog yod mapraw (sour curry with fish and young coconut). If you cannot end your meal without a sweet treat, the kluay buad shi, a dessert of bananas in coconut milk, will satisfy your sweet tooth.